Discussion: KAL Nutritional Yeast is primary grown on molasses. This natural source produces yeast flakes containing a full spectrum of essential amino acids and a balanced variety of B Vitamins. These premium vegetarian flakes are unsweetened, non-GMO and naturally low in fat and sodium. 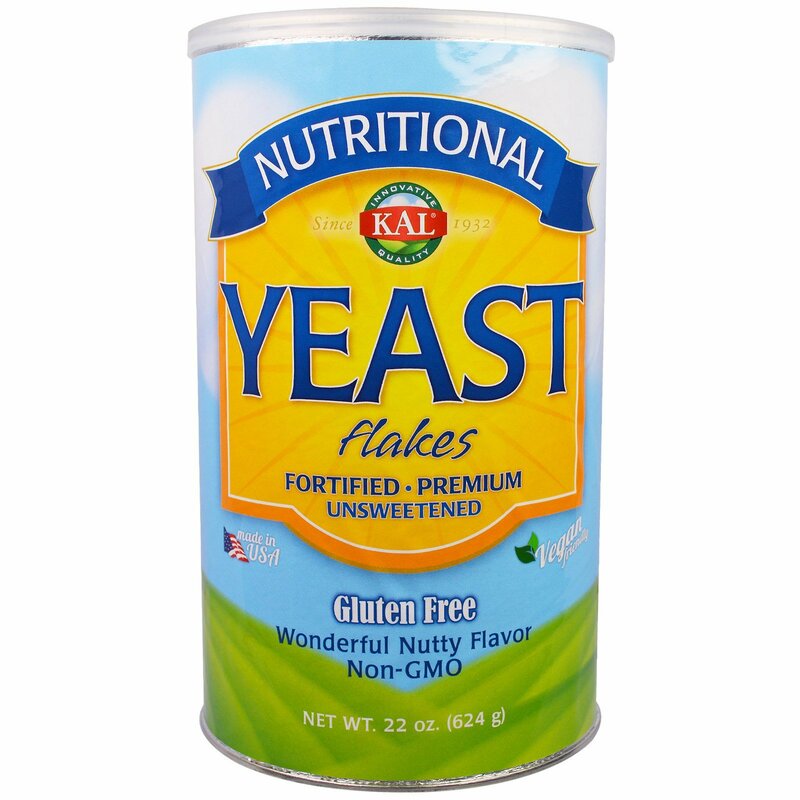 KAL Nutritional Yeast is specially fortified with B Vitamins for additional dietary support. Traditional brewer's yeast is produced through the brewing process and can have a bitter aftertaste. Since KAL Nutritional Yeast is primary grown, only the naturally delicious taste shines through. Experiment with the nutty, roasted flavor by adding these flakes to your favorite foods. Mix 3 rounded tablespoons of KAL Nutritional Yeast with water or broth as an excellent between meal snack. Or simply mix with fruit or vegetable juices to make a nourishing drink. It is instantly dispersible in liquids and may be mixed in food to enrich its nutritional value. Primary grown nutritional yeast (saccharomyces cerevisiae), niacin, pyridoxine HCl, riboflavin, thiamine HCl, folic acid and vitamin B-12. 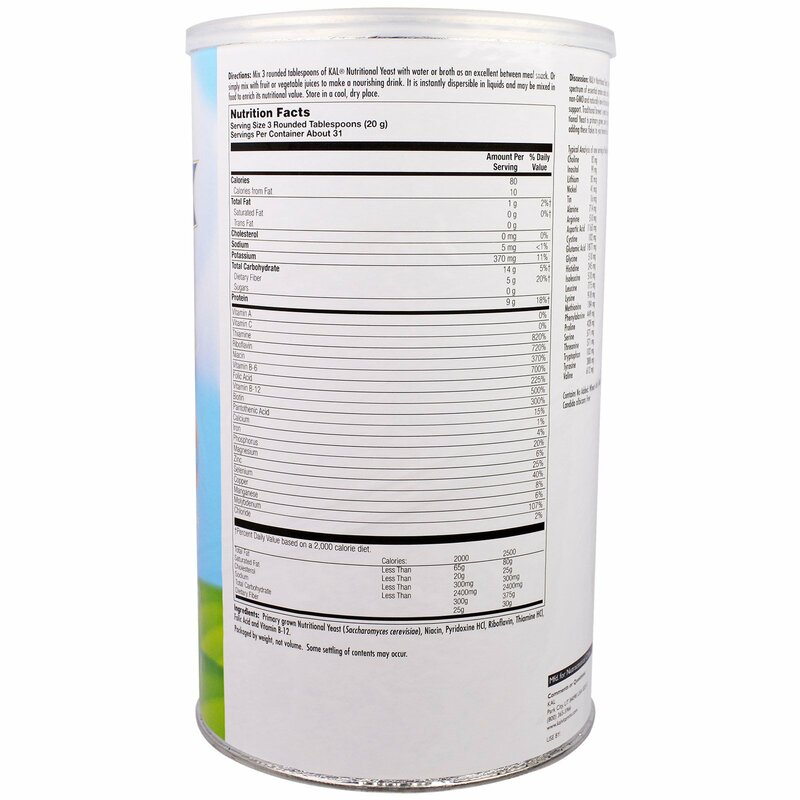 Contains no added: Wheat, corn, milk, egg, soy, gluten, sucrose, animal derivatives, artificial colors, starch or preservatives. Fill level controlled by weight, not volume. Settling of contents may occur during shipping.